These graphs come from Durance and Ormerod (2007) and published in the journal, Global Change Biology. 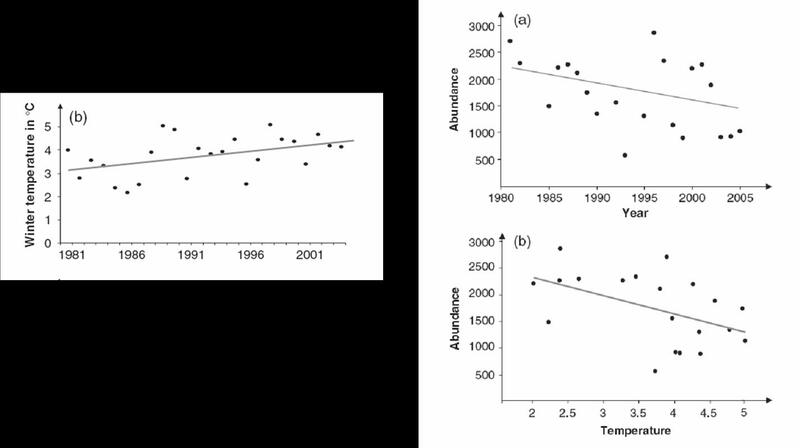 In this paper the researchers were studying the question, what is the effect of temperature on macroinvertebrates in three Welsh streams. The three graphs included tell the story. The left graph (b) is actually the place to start as it demonstrates that water temperature (y-axis) increased over a 25-year period (x-axis). (It may be pertinent to remind student how meaningful a change of 1-2 degrees Celsius can be and that many organisms have a narrow range of tolerance with respect to temperature.). Graph (a) then shows how the abundance of macroinvertebrates (y-axis) changed over this time (x-axis). And lastly, the abundance graph (b) shows the correlation of abundance and temperature. It should be explained to students that macroinvertebrates are critical to stream ecosystems as they are part of the food web and are a resource for a variety of consumers at higher trophic levels. This study demonstrates nicely how some climate change research is performed. Although many studies make use of artificial environments (e.g. greenhouses with elevates CO2) researchers can also take advantage of natural climatic variation and look for patterns during warmer or cooler phases. In this example, the temperature variation is mostly driven by the North Atlantic Oscillation (NAO). This climatic patterns is similar to El-Nino climatic patterns from the South Pacific that influence climate and weather patterns in the western United States. 1.Have students create a range of tolerance graph for the above data with macroinvertebrate abundance on the y-axis and temperature on the x-axis. 2.Have students research El-Nino patterns in the Southern Pacific Ocean. How do these patterns influence the climate in the United States? 3.How would happen to climates if the patterns of El-Nino and La-Nina changed?